Cool food to room temperature before storing in the refrigerator/freezer. Placing warm food in it raises the temperature inside, thereby, increasing power consumption. Place the refrigerator/freezer far enough from the stove or range so that it will not be affected by the heat generated from the cooking. Install it where air can circulate freely around. Defrost your refrigerators/freezers regularly. Frost acts as an insulating blanket which causes the motor to work overtime resulting in increased power consumption. Clean periodically the compressor units and condenser coils at the back or bottom of the unit. 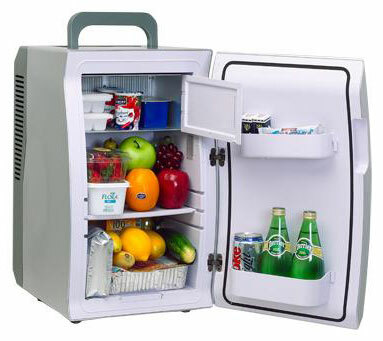 Overcrowding your refrigerator/freezer may interfere with air circulation and overworks the compressor. Avoid leaving the refrigerator/freezer door open longer than necessary. Check the gaskets around the refrigerator/freezer door. Adjust the door or replace the gasket if there are leaks. To check the door for air leaks, close the door on paper money. If you can slide the money out easily, you need to replace the gasket. When buying a refrigerator/freezer, remember that a frost-free model needs more energy than a standard model.